It's time for our first challenge of 2018! is the hostess for the new year's first challenge. She chose the word 'MUSIC'. from Sassy Cheryl called 'Don't stop the music'. The sentiment is from Purple Onion Designs. and used as a mask. and then removed the mask. Then colored him with Copics. This is so adorable. Love the dancing dog. Hi Doni. Thank you for your welcome to the Team. I am so excited to be a part. 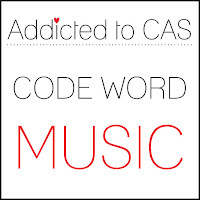 I love your take on the code word. I could hear Judy Garland singing in my head instantly, and then of course, the Partridge Family theme song popped in... RIP David Cassidy... 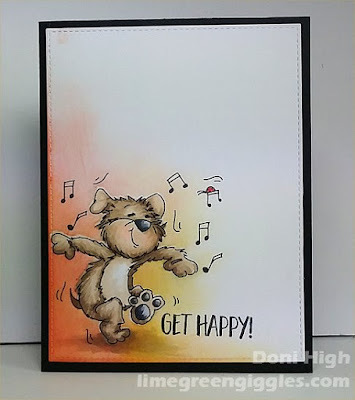 Anyway, I love your dancing bear and what a great way to add the colors around him. Great use of masking. Beautiful coloring on the bear. Great take on the challenge. This little fellow makes me want to dance, Doni. Hes is so cute and beautifully colored and I love the background you inked behind him. Oh my, I'm smiling out loud! This is SO sweet! Awesome coloring and such a funny and happy card. Love the background coloring too. Oh my gosh Doni, this is the CUTEST card in the whole world!!! Beautiful Copic coloring and I love your choice of DI's for your ink blending...so adorable! On my gosh...nothing cuter than this card. Love how you colored your little happy guy. Just perfect. Happy New Year! Oh, how adorable! Love the great inking you did around this sweet little image!